UnitedHealth Group (NYSE: UNH), the largest health insurer in the U.S., operates two primary businesses – UnitedHealthcare and Optum. UnitedHealthcare includes health insurance plans provided to employers & individuals, and community solutions such as Medicaid and children’s health insurance, while the Optum division covers services such as pharmacy benefits management (PBM) and health care services. In UnitedHealthcare, although growth in the employer & individual business has stagnated, other businesses witnessed double-digit growth in 2017. Medicare & Retirement’s 40% contribution, the highest, to total UnitedHealthcare revenue was primarily driven by strong Medicare Advantage performance. In the Optum business, OptumHealth saw the biggest jump, which was driven by a 9.6% increase in customers, as a result of growth in care delivery, consumer health engagement services, and health financial services. 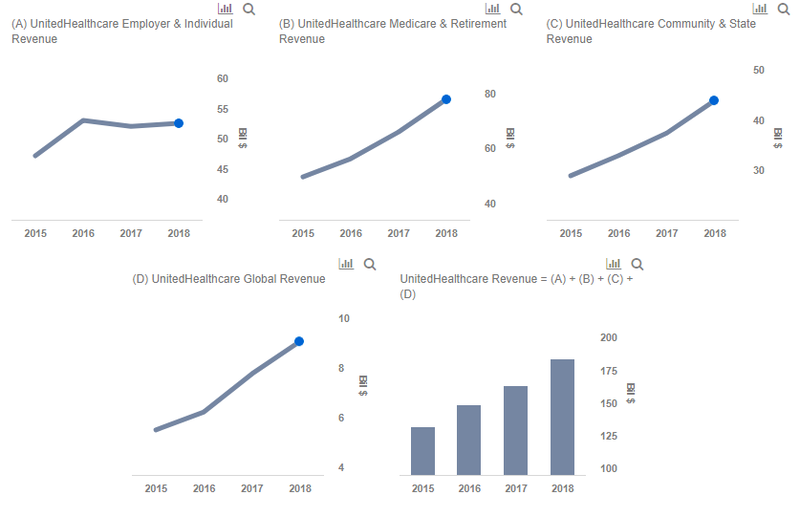 We have created an interactive dashboard analysis that shows UnitedHealth’s key revenue sources and the expected 2018 performance. 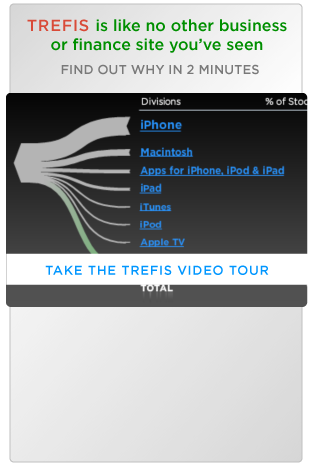 You can adjust the revenue drivers to see the impact on the overall revenues, EPS, and price estimate. The number of people that the company serves via public and senior plans has been on a strong run for a while now, and we expect this trend to continue in the near term, as the population of Medicare beneficiaries is slated to grow in the coming years. Per a report from PWC, Medicare Advantage will cover about 21 million people in 2018, on the back of baby boomers reaching the age of 65. Given the potential for growth, the competition among the insurers is heating up and an important factor that can tip the scale in an insurer’s favor is customer engagement. This is where UnitedHealth’s digital services, call advocates, consumer-centric benefit designs, and nurse coaches stand out. Moreover, the acquisition of Chile’s Banmedica, and growth in other parts of Latin America should continue to expand the company’s global business horizon. The greatest strength of UnitedHealth’s business model is that its divisions – UnitedHealthcare and Optum – complement each other well. This allows Optum to utilize UnitedHealthcare’s expertise (and vice versa) to provide painless consumer experience. OptumCare, a health service delivery business, is seeing strong growth and we expect this trend to continue in the coming years. This will be driven by continued use of analytics that will help the business penetrate into different markets. Also, the acquisition of DaVita Medical Group should create synergies and help OptumCare expand its portfolio. 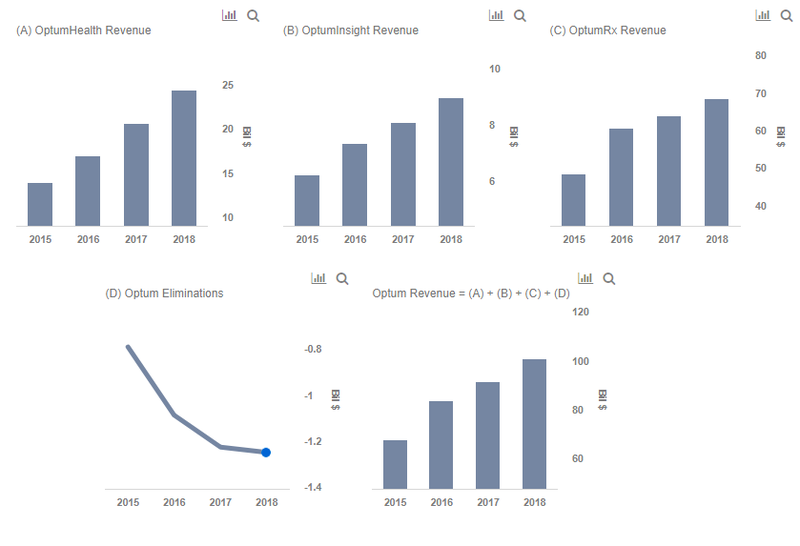 OptumRx, the largest Optum business, saw 5.5% revenue growth and is witnessing high retention rates, which bodes well for the company. Growth in script volume should further boost revenue in 2018. Furthermore, solutions such as Rally Care and PreCheck MyScript deliver physicians search and drive price transparency, thereby engaging more customers. We forecast Optum business to generate $68.4 billion in revenue, which roughly equates to about 45% contribution to UnitedHealth’s total revenue. Finally, we maintain our $265 price estimate for UnitedHealth, which is slightly ahead of the current market price. Disagree? Detailed steps to arrive at UnitedHealth’s price estimate are outlined in our interactive dashboard, and you can modify our assumptions to arrive at your own estimate for the company.